Known as ‘Island of Gods’, Jeju Island is a volcanic island with scenic natural beauty, unique cultural traditions and a temperate climate. Korea’s Jeju Volcanic Island and Lave Tubes were designated as World Natural Heritage site by UNESCO. About an hour flight from the major cities of Korea, Jeju Island will amaze you with its beauty. The harmony of the mountains, ocean, the smaller islands, and the beautiful beaches- all unique with different sand colors and different hues of water- make Jeju an amazing travel destination. The mysteries that you will discover in Jeju are endless and every time you visit, there will be more secrets to unlock and more places to experience. Important: This is a Seat-In-Coach tour with a daily departure. After breakfast, your tour guide will pick you up from hotel in Jeju Island. 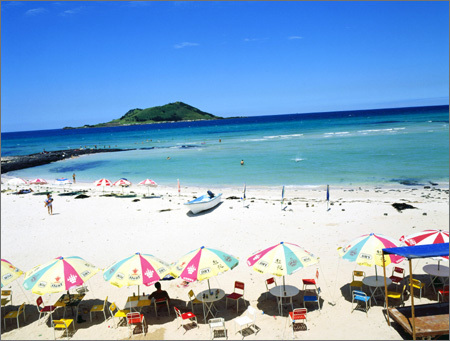 Tour bus and head over to Gimnyeong Beach, one of must go to beaches in Jeju Island due to emerald colored beaches with charmingly decorated cafe. Then you will visit Manjanggul lava tube that stretches for as far as 7.4km which was formed when the lave that was deep in the ground spouts from the peak and flows to the surface. After having seasonal local lunch you will enjoy haenyeo performance. haenyeo literally means "Sea-Women" and they are divers in Jeju Island who dive into the ocean to catch various seafood or oceanic organisms. Then continue on to visit Seongsan Sunrise Peak, designated by UNESCO as World Nature Heritage in 2007. 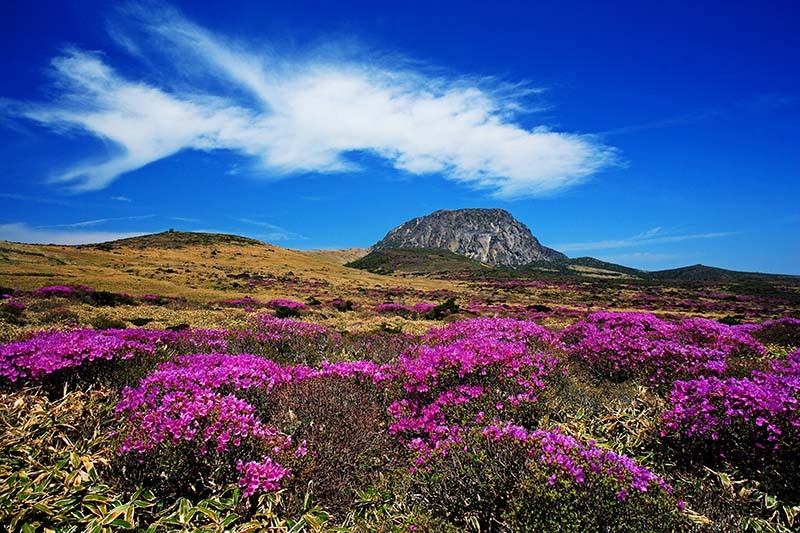 Seongsan Sunrise Peak rose from under the sea in a volcanic eruption over 5,000 years ago. Located on the eastern end of the Jeju Island, there is a huge crater at the top of Sungsan Sunrise Peak. Afterwards you will visit Saryeoni forest path. On the eastern border of Mt. Halla National Park, this is a popular weekend walking destination with 15km of forest paths. Finally, you will stop by a Daheeyeon where is a green tea garden located on the eastern side of Jeju Island. Not only does it have a large field of green tea, you can also zip line, enjoy delicious green tea ice cream at the Cave Cafe and soak your feet in a nice foot bath for 30 mins. After the tour, we will transfer you to hotel and spend rest of the day at leisure. 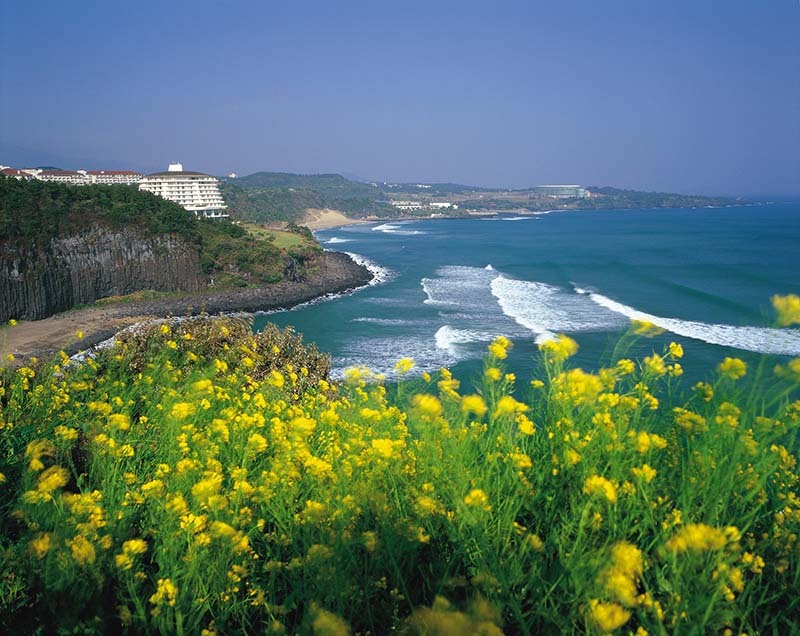 After breakfast, your tour guide will pick you up from hotel in Jeju Island. Tour bus will head over to Eorimok trails, which are surrounded by lush forest of Mt.Halla. Then visit Olle trekking 8 courses via Yakchen Temple. After having a seasonal local lunch visit Jusangjeolliade, also called Seaside Cliff, a popular spot due to an impressive pillar rock formation along the coast of Jeju Island and is a designated cultural monument of Jeju Island. This cliff was also formed when the lava from Mt.Halla erupted in to the sea of Jungmun area. Then move on to the famous Dragon Head Shore situated at the bottom of Mt. Sanbang at the north of Jeju City. The locals call it "Yongduam" meaning "dragon head" in Korean due to its distinct shape similar to a dragon head. The Dragon Head Shore was created by strong winds and waves over thousands of years. If you are visiting during November through January, you will proceed to experience tangerine picking. Jeju Island"s tangerines are known for its abundant nutrients and sweetness. If you are visiting during the month of February through October, you will visit the Spirited Garden which is famous forbonsai theme park. Finally, stop by Mysterious Road which is one the must go to tourist spots in Jeju Island. Optical illusion that makes it"s appear to be sloping upwards when infact it runs downhill.